Fig. 4. Effects of NOX-derived ROS generation on TBBPA-induced MMP-9 expression. (A) Cells were treated with 1, 5, or 10 μM TBBPA. Cells were lysed and total RNA was prepared for MMP-9 analysis. (B) Cells were transfected with MMP9-Luc and then pretreated with inhibitors (NAC or DPI) for 30min followed by TBBPA for 24 hr. Cells were then harvested and assayed for luciferase activity. (C) Cells were pre-treated with DPI for 30 min and TBBPA was added for an additional 10 min. Cells were harvested to measure NADPH activity as described above. (D) Cells were pre-treated with NAC or DPI for 30 min, and TBBPA was added for an additional 20min, followed by H2DCFDA for 30 min. Each bar represents the mean ± SD calculated from three independent experiments. (E) Cells were pre-treated with NAC or DPI for 30 min and TBBPA was added. 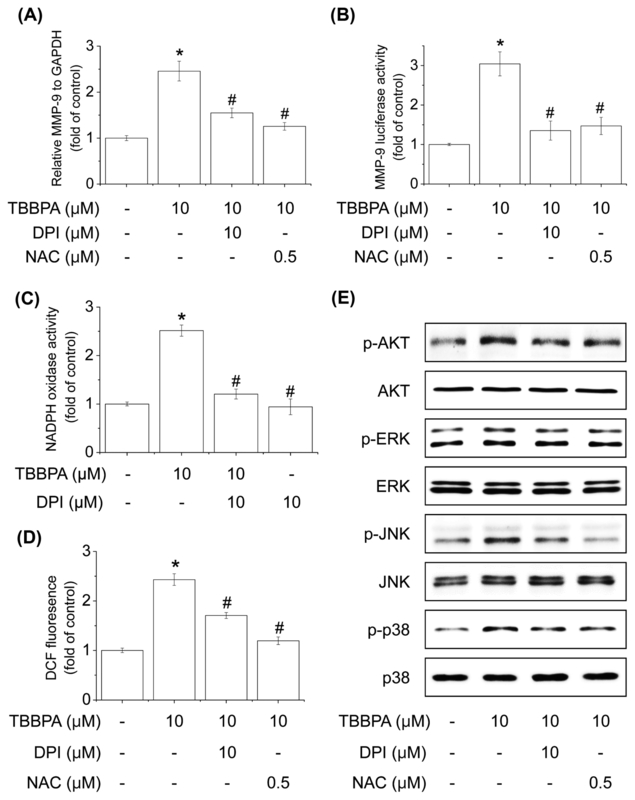 The extracts were analyzed for Akt and MAPK activation using antibodies against phosphorylated Akt, ERK1/2, JNK, and p38 MAPK by Western blot analysis. *Significantly different from the control at p< 0.01. #Significantly different from the TBBPA at p< 0.01.